It's not that the mallards aren't showing up anymore. Dave Crolick still sees them from his blind on one of New York's Finger Lakes. He even kills some every season. Something is different, though. There aren't quite as many birds, he says, and they just don't seem like the same duck they were 15 or 20 years ago. "When I was a kid, we'd watch thousands of mallards come off the refuge in the morning and then go back at night. We'd always pull a few down. The ones we killed in the afternoon were full of corn. Now we never kill a mallard with corn in it and we just aren't killing mallards like we used to," says Crolick, a 55-year-old landscape supervisor from western New York. He's not alone. Hunters up and down the Atlantic Flyway are noticing a similar trend. Based on the U.S. Fish and Wildlife's annual duck count, it's not just their imagination. While mallard numbers are at near-record highs in the rest of the country, the Atlantic Flyway population is 27 percent below the long-term average of 735,000 breeding pairs. Last year's count was 540,000, down 15 percent from 2014. It's not that Crolick and his fellow Atlantic Flyway hunters aren't shooting mallards. Harvest figures in New York, for example, have been relatively stable since the mid-90s. Overall, though, there has been a steady downward slide in the Atlantic Flyway mallard harvest since the early 2000s when hunters shot a half-million or more. Last year, they killed fewer than 300,000. Scientists don't dispute a flyway-wide decline in greenheads, but there doesn't seem to be much consensus on the causes, says USFWS Atlantic Flyway representative Paul Padding. "Biologists have been struggling with this. There is no obvious cause. 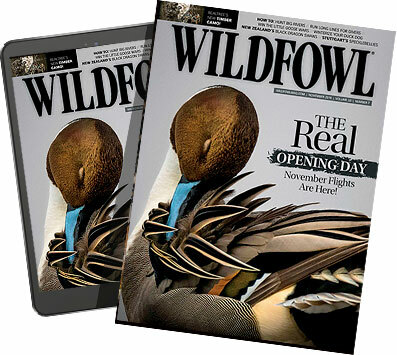 We haven't lost that much habitat and Atlantic Flyway mallards aren't prone to the drastic fluctuations in available nesting habitat like they are in the Prairie Pothole Region, so it's been difficult to put a finger on a single cause," he says. State University of New York-Oswego zoology professor Dr. Michael Schummer agrees to some extent. What many hunters don't realize is that about half the ducks shot in the northeastern U.S. are local birds. They are born close to where they die. That's why Schummer thinks a decline in habitat quality may actually be playing a role. "There are two likely causes. The quality of the nesting habitat is changing or we are overshooting them, but overshooting doesn't seem to be the case either," he says. Harvest trends only add to the mystery. They have been relatively stable in New York, but the state's resident breeding mallard population has been declining since the late 1990s, when surveys found around 100,000 breeding pairs. Last year, biologists counted around 67,000 pairs. While Crolick is seeing fewer mallards overall, others, including Canandaigua Lake Duck Hunters president Paul Niedzielski, continue to enjoy good seasons. He's been hunting the Finger Lakes for more than 25 years and has not seen a significant decline in mallards in the region he hunts, although he agrees "something is going on." "The birds are definitely getting here later, they aren't in the same places they used to be and we have to work harder to find them," he says. Scientists know drought can be a significant factor in duck production in the Prairie Pothole Region, but it does not seem to be playing a role in the Atlantic Flyway. Schummer and SUNY graduate students investigated the influence of drought on breeding mallard numbers in New York. "We found the same number of birds in dry years as wet years," he says, "but similar to other research, we detected a decline in mallard breeding abundance even after accounting for spring rainfall and regional habitat impacts in NY." Which is why Schummer wonders if the flyway-wide decline is somehow related to a decline in habitat quality and not quantity. There is no research that examines what may be affecting nesting habitat in the Atlantic Flyway, but he wonders if the increased use in pesticides is playing a role. "The birds are definitely getting here later, they aren't in the same places they used to be and we have to work harder to find them..."
"We are killing insects like crazy," he says, suggesting that the decline in aquatic invertebrates may be contributing to lower survival rates for ducklings, which depend on insect larvae during the first weeks of their life. "Obviously, this is a hypothesis," he says, "but given the unknowns about what is going on with Atlantic Flyway mallards, it remains valid to investigate." Another factor affecting Atlantic Flyway hunters, says Padding, is mallards from the mid-continent no longer migrate to the southeast and mid-Atlantic like they used to. Again, though, scientists don't know why that's happening. "That's been declining for a long time," he adds. "It may have to do with an increase in food abundance in the mid-continent, or it may have to do with an increase in the duration of open water farther north, but that's purely speculation." Later snow cover and freezes may be playing a role in migrations and hunter success in the Atlantic Flyway, as well. Researchers at Long Point Waterfowl determined that the migration of dabbling ducks to mid-latitudes in the Mississippi and Atlantic Flyways is likely taking place an average of a month later than in the mid-1970s. The birds won't fly south if they don't have to, it just doesn't make sense if they have to fly back north to breed. That could explain why New York's harvest has been stable even as resident bird numbers slide. Also, in mild weather they don't have to feed as much and Crolick wonders if he's killing fewer mallards because they are spending more time on refuges and other places that aren't open to hunting or are subject to limited hunting, including an increasing number of private flooded corn impoundments. Schummer, however, doesn't think that's the case. "Geographically, flooded corn is just a blip on the landscape," he says. That may be true in New York, but Josh Homyack, Maryland Department of Natural Resources' waterfowl program manager, says the amount of flooded impoundments on private ground in his state has increased dramatically. "It's definitely something we talk about a lot. We are seeing a pretty significant increase in impoundments on private land and they can hold an awful lot of birds at times, particularly during warmer winters when those impoundments stay open all season," he says. "What impact they are having on mallards and the harvest, though, is something we just don't know." Crolick acknowledges there's little he can do to return to the great hunting he experienced 20 years ago on his favorite spots, but he would like to see some changes. Mostly, he'd like to see the season structure in his area shift to later dates to account for the later migration. But even that may not help much, at least not in the future and certainly not for hunters farther south. Schummer says computer modeling shows the average migration out of the Great Lakes region won't peak until as late as Jan. 5, by the end of the 21st century if current weather trends continue. "That is," he says, "if they migrate at all."